This butterfly is standing on a large daisy. 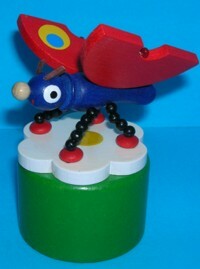 Its wings have been painted with large yellow, blue and green spots - one at each corner and he has antennae are made of leather. Good push action. Made in Czech Republic.